The Fine Art of Paper Flowers is an elevated art and craft guide that features complete step-by-step instructions for over 30 of Tiffanie Turner’s widely admired, unique, lifelike paper flowers and their foliage, from bougainvillea to English roses to zinnias. 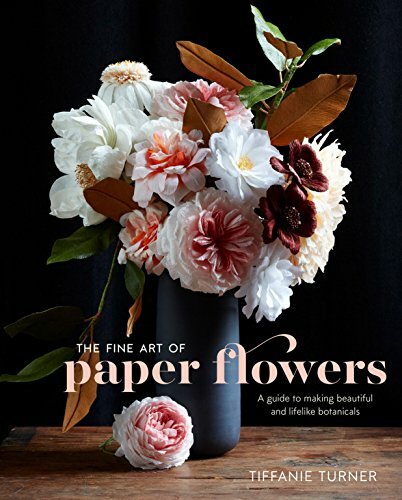 In the book, Turner also guides readers through making her signature giant paper peony, shares all of her secrets for special paper treatments, candy-striping, playing with color and creating botanical imperfections, and shows how to turn paper flowers into gorgeous garlands, headdresses, bouquets and more. These stunning creations can be made from simple and inexpensive materials and the book's detailed tutorials and beautiful photography make it easy to achieve dramatic and lifelike results.